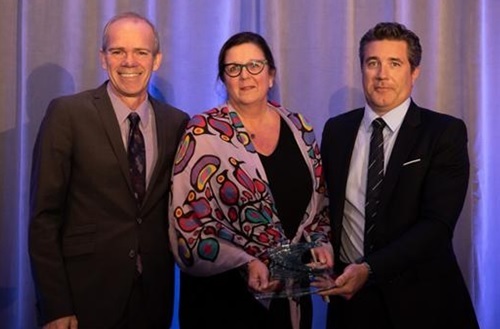 Winnipeg, MB (October 29, 2018): At the 35th Manitoba Business Awards Gala held on Friday, October 26, the Manitoba Museum received the Manitoba Chambers of Commerce award for Outstanding Social Enterprise. Business leaders from across the province celebrated innovators, entrepreneurs, and the builders of Manitoba’s business community. Each year, the awards celebrate the diverse businesses that make up Manitoba`s growing sectors. With finalists representing all corners of the province, the awards also recognize the contributions of companies and individuals that make a lasting impact on our province. The Outstanding Social Enterprise award is presented to a not-for-profit or philanthropic organization that exemplifies excellence and innovation in their programs, services and projects, and their efforts to be self-sustaining. The award also represents the organization’s dedicated focus on achieving a social vision and a mandate that makes an outstanding contribution to the social, cultural, or economic well-being in their community. The presentation of Outstanding Social Enterprise by Winnipeg Free Press Publisher Bob Cox recognizes the great work the Manitoba Museum has done over the last 48 years and acknowledges the current Bringing Our Stories Forward Capital Renewal Project to ensure its growth, relevancy, and sustainability. With a vision of expanding knowledge, sharing stories, and encouraging discovery of Manitoba, the world and our universe, the Museum tells Manitoba’s stories, bridging language, culture, ethnicity, and age. These stories help to make sense of the world and are essential to how we relate to one another and our environment; how we teach and learn; and how we innovate and progress as a society. The Manitoba Museum makes significant contributions to the richness of life in Manitoba, and its relationship with the community is strong. The Museum creates the opportunity for enlightenment and entertainment for over 300,000 visits every year. Providing a vital educational role, 75,000 of those visitors are students and over 45,000 of them are individuals in special circumstances who receive free admission to the Museum, the Planetarium and the Science Gallery. Not only does the Museum reflect Manitoba’s rich and diverse history, but it is also the province’s central repository of heritage materials and supplier of heritage services with over 2.8 million artifacts and specimens, including the internationally renowned Hudson’s Bay Company Museum Collection. An organization committed to community participation, the Museum partners in the telling of stories for exhibitions, including Ingenious peoples, newcomer communities, and organizations like the Treaty Relations Commission of Manitoba, Parks Canada, Aboriginal Sport Achievement Centre, and the Truth and Reconciliation Commission of Manitoba. The Museum also works with a multitude of Universities, Museums, and Science Centres on various research projects, exhibitions, and programs. The breadth and depth of the Manitoba’s Museum contribution to the community are unquestionable. As the Museum approaches its 50th anniversary in 2020, the Museum’s Capital Renewal Vision will see the beloved institution repositioned and elevated for its next 50 years. The first phase was the expansion of Alloway Hall to host larger, world-class traveling exhibits, rentals, and public programs. The second phase is the Bringing Our Stories Forward Gallery Renewal Project, which will see 42% of the Museum Galleries updated, ensuring the Museum remains relevant and that generations of Manitobans will come away inspired. The Manitoba Museum was in good company for the award. The other finalists were Building Urban Industries for Local Development (BUILD) Inc. and the NorWest Co-op Community Health Centre. Recognized for its impact in the community, the Manitoba Museum has won four awards in the last year. The Nonsuch gallery renewal project won the Association of Manitoba Museums’ Exhibition Award of Excellence; the Spirit Lines, northern outreach project won the Governor General Museums Alive! Award and the International Guardians of Culture and Lifeways Award for Outstanding Project/Non-Native Museum Award from the International Association of Tribal Archives, Libraries, & Museums; Curator of Botany Diana Bizecki-Robson, Curator of Botany was presented with the Bruce Naylor Award by the Alliance of Natural History Museums for excellence in botany research of national significance; and the 5Oth anniversary celebration of the Planetarium received the STAM Science Achievement Award from the Science Teachers Association of Manitoba.